Contribute to the Continued Restoration of SEALAB I. We are raising money to help pay for the continued restoration of SEALAB I. Bricks are $50 each and can be ordered with this order form. Please return the completed form and payment to the museum or mail to the address on the form. To protect the extensive restorative work completed in 2016. a shelter will has been placed over SEALAB I. Additionally, in order for SEALAB I to continue making history, work will be completed inside to allow groups to inhabit the vessel for extended periods. 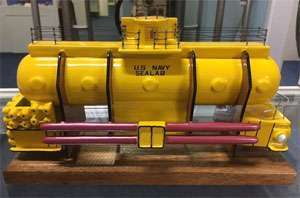 Once again, SEALAB I will become a unique educational tool allowing groups to experience what the Navy’s first four aquanauts experienced in 1964. Drawing will take place when all 100 tickets are sold. For questions about your tickets please call our office at 850-235-4101.